As far back as in 1975, the Lions Club Ravenna Host realized the plates that identify over 80 historical buildings of Ravenna. The plates were put just near the entrances of each building. Our initiative contributed to make to know and to valorize such buildings that, notwitstanding their particular historical interest for our town, risked to be darkened by the inimitable artististic patrimony of our city, actually protected by the UNESCO. After more than 40 years we thought to make a footstep ahead: in such a way we fournished to our citizens and to the many tourists visiting our beautiful city, a greater information on the very rich artistic patrimony in Ravenna, using for it the modern computer technologies. Our Project was developed with the cooperation of the High School of Studies on the City and the Region of Bologna University, with the contribution, for the historical-photographic documentation, of Institution Library Classense of Ravenna, in accordance with the Superintendence Archaeology, Belle Arti and Landscape of the Provinces of Ravenna, Forlì-Cesena and Rimini and with the patronage of the Municipality of Ravenna. On each of the 89 selected historic buildings, the affixion of a plate with the designation of the building, the period of its construction, a brief description (in Italian and English) of its historical and artistic characteristics. Moreover we put a QR Code to allow everybody to view a “card” (this too in Italian and English) complete with pictures, which provides a more comprehensive description, on a smartphone or a tablet. The creation of a dedicated web site, structured in such a way as to allow the visualization of the information described above, accessible both through QR code, and through common search engines on the internet. The publication of the the research carried out, enriched with the images of historical and architectural interest, destined to a deep study on the selected buildings; publication edited by the School of Studies on the City and the Region University of Bologna. 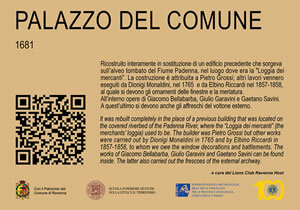 The publication of a “guide” (in Italian and English), with a short space dedicated to each building, with its image and the text that appears on the plate. This guide should be distributed through tourist offices, hotels and Ravenna’s area schools. In such a way the reader could be invited to broaden his knowledge of the “Notable buildings in Ravenna” and to help him to prepare his personal journey. This project was originated during the Presidency of Paolo Balella (Past president of Lions Club “Ravenna Host”), and is one of the initiatives for the celebration of the Centennial Lions Club International. This project is one of the “Services” that the Lions Club “Ravenna Host” (the oldest and the largest Lions Club of Ravenna, with over 100 members) has made for over 60 years towards the local community, to help people in need and to support culture; this in accordance with our guidelines: “Ravenna is suffering, let us help it!” and “Ravenna is beautiful: let’s rediscover it!”. Have a Good journey to (re) discover the rich artistic heritage of Ravenna! The first of the new plates, affixed at the entrance of the City Hall. Special thanks to the Owners of historical buildings and to the City Institutions of Ravenna that have encouraged and supported our initiative. MRV Costruzioni Edili Srl who installed the new plates.